Click on the button below to view all the tour dates and locations for our Discover Tech exhibition. Discover Tech is made possible through the support of the National Science Foundation. The exhibition and its educational support materials and outreach opportunities are part of the STAR (Science-Technology Activities and Resources) Library Education Network (STAR_Net), a hands-on learning program for libraries and their communities. Partners include the National Center for Interactive Learning (NCIL) at the Space Science Institute (SSI), American Library Association, Lunar and Planetary Institute (LPI), and Afterschool Alliance. 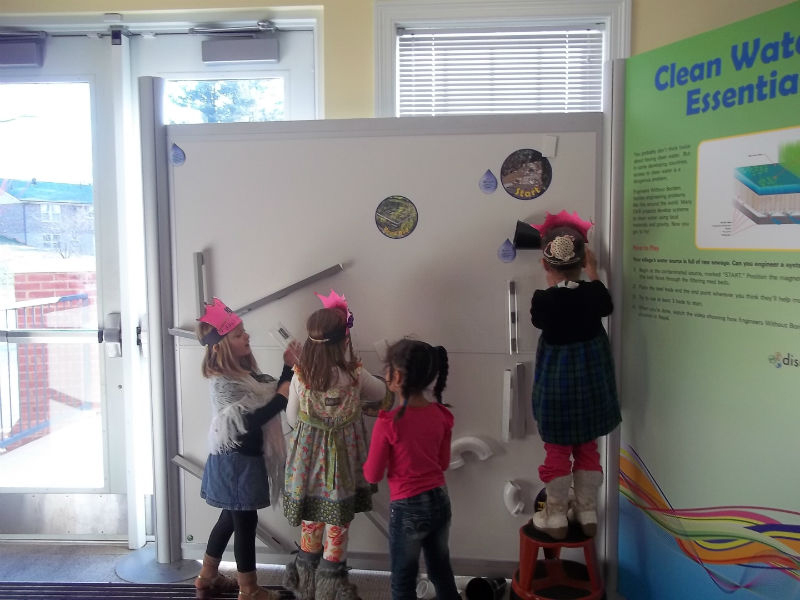 The STAR_Net team selected nine public library sites to host the second national tour of the interactive traveling exhibition Discover Tech: Engineers Make a World of Difference. Discover Tech will tour from January 2016 through December 2017. The eight sites selected will host the exhibition for a period of approximately three months each. The exhibition requires 800 square feet of space for optimal display. Each site was awarded a grant of $1,000 to support public programs related to the exhibition. The Discover Tech traveling exhibition includes a research study and evaluation of informal science education in a library setting. The knowledge gained through the evaluation of the Discover Earth project about the nature of informal science learning in libraries will benefit both libraries and the informal science education (ISE) community. A two-day orientation and program planning workshop for two library staff (Project Director and Project Coordinator) from each host library was held on November 3 and 4, 2015 at the Mamie Dowd Eisenhower Public Library in Broomfield, Colorado. The workshop included an overview of STAR_Net and the exhibit as well as hands-on science activities from the Lunar and Planetary Institute, programming and outreach consultation with the Afterschool Alliance; and a number of professional training resources, including the STAR_Net Online Community. Through exciting interactive elements and displays, visitors to the Discover Tech traveling exhibition will realize that engineers are real people who, through a creative and collaborative design process, arrive at practical solutions to help solve society’s problems in the U.S. and throughout the world. Visitors will become familiar with the National Academy of Engineering’s 14 Grand Challenges for Engineering, critical issues that must be addressed in the 21st century. They will also learn about the fundamental principles of energy, become aware of their own energy use, and understand the impact of engineering on societies over time and place. Discover Tech: Engineers Make a World of Difference is an exciting new traveling exhibition that shows how engineering provides solutions to better meet human needs and develops sustainable innovations for the future, and how engineers create new technologies to solve problems. The exhibit features hands-on and multimedia components that allow exhibit visitors to interact with exhibit content in a dynamic way, encouraging new perspectives about engineers and their vital work. The exhibit includes three areas: A. Engineering: Past, Present, and Future, B. High Tech/Low Tech, and C. Power Up! 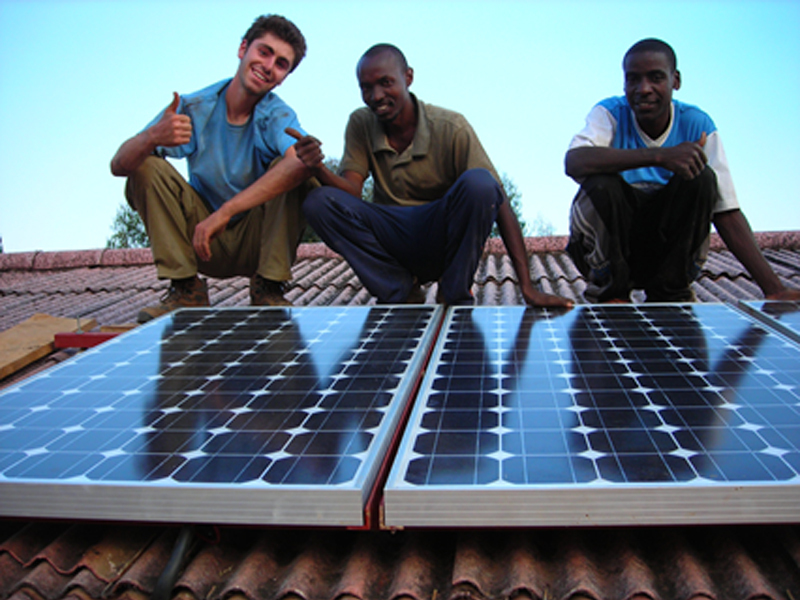 Creating a Sustainable Energy Future. Discover Tech features a number of hands-on activities that engage people of all ages. The Discover Tech Quiz Game is a fast-paced and humorous version of a TV game show. Up to three visitors will be able to play the game with a host (an animation of a robot figure) asking questions about engineering and technology and delivering the answers. The game allows participants to explore the engineering process while correcting misconceptions about what engineers really do. The Tabletop Arch building activity is a fun and engaging way for visitors to work together and learn about how arches behave. A large building block activity will be available for young children to learn to design and build a variety of structures. 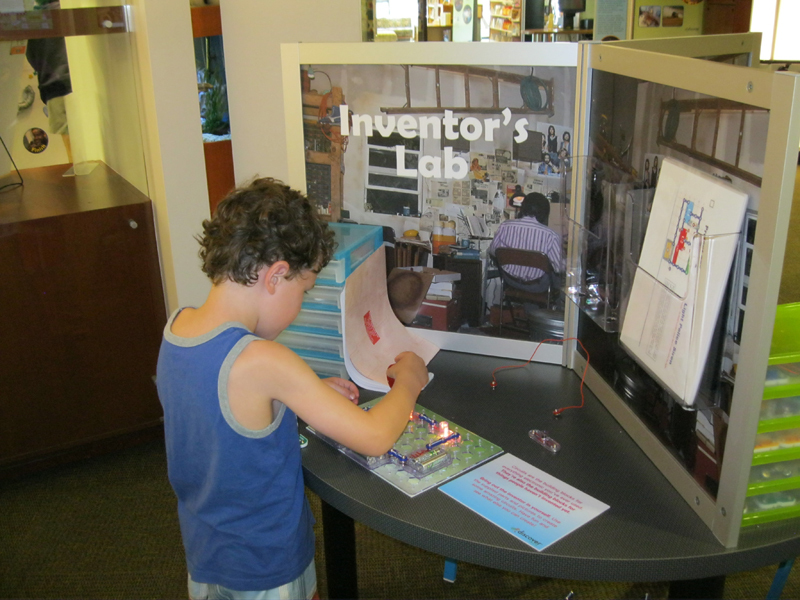 At the Inventors Lab Station, they can build a variety of electrical circuits, and at the Solar Power Station they can explore how a solar panel actually works. They also learn about the importance of energy in modern society. Using a hand-crank generator, visitors can produce electrical energy that can be used to power various types of light bulbs and learn which one uses the least energy to operate. 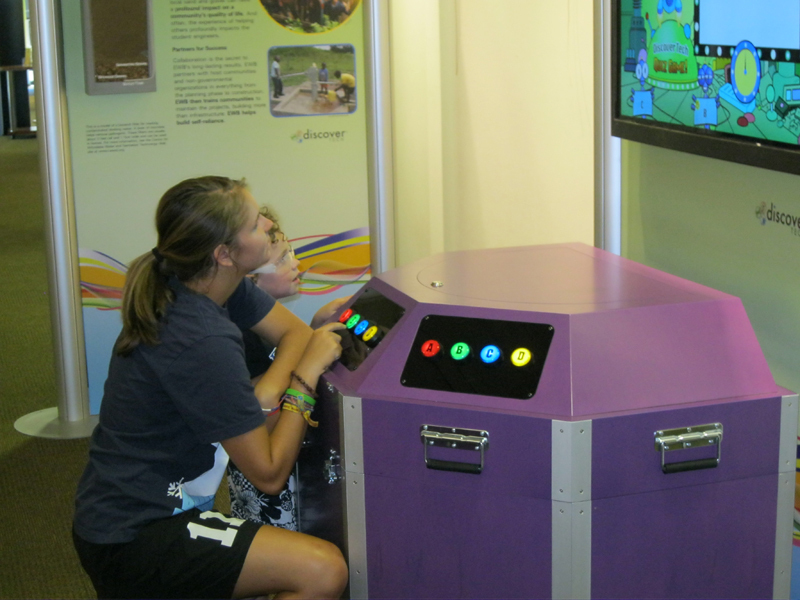 A state-of-the-art, 42” interactive touch table includes an activity called Game Changers that presents critical engineering problems based on the 14 Grand Challenges for Engineering (in partnership with the National Academy of Engineering). Exhibit visitors can view several inspirational videos showing members of Engineers Without Borders using their skills to profoundly improve the quality of life for communities in Central America, South America, Africa and Asia. 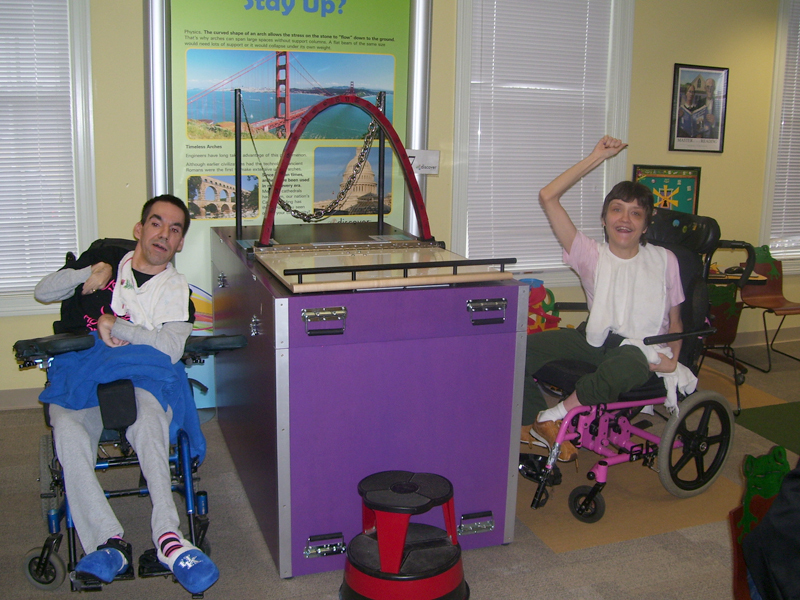 Two Discovery Stations include various hands-on building activities such as Keva planks. A Photo Wall titled “I am an Engineer” will be created by each exhibit site featuring photos of community members performing engineering activities, for example, a car mechanic, an engineer from a local factory, a student who built something that had an impact on the community, or a historical engineering project that affected the community.